AwayFind’s mission is a noble one – to help you stop checking email and stay out of your inbox as much as possible. AwayFind’s services alert you about important messages so you don’t have to obsessively check your inbox 10 or more times a day. Depending on rules you set up, AwayFind will scan through your inbox and send you notifications through many mediums such as phone call, SMS, iPhone, and Android push notifications. AwayFind is an ideal option for avoiding email and information overload. Let’s find out exactly how it works. Considering all the unique features, setting up AwayFind is easy. I quickly set up an account using Gmail oauth, and I was guided through the whole process (and if I can do it, so can anyone). I chose to use SMS messages as the main notification method, and when I keyed in my cell phone number, I received a verification code immediately (it’s also refreshing that the code is only 2 digits, and I didn’t have to enter a 14 digit hexadecimal code). After this, I was allowed to set up the email filters that can apply to all my incoming mails. When doing this, you will notice two filters that are already set as examples. The first filter allows you to receive notifications when a contact you’re meeting with ‘within 12 hours’ sends you an email, and the second one is an email with ‘asap’ or ‘urgent’ flags. You can set up new contacts based on the subject, the contact’s name, etc, and specify a time at which you prefer receiving these notifications. Having set up the filters, you can now look at other unique features: email signatures, intelligent auto-responders, an iPhone and Android apps and customized contact forms that can be used by contacts to send you alerts. – Outlook and Gmail plugins that help you to set up and edit filters without necessarily signing into the site. – Unique, intelligent ways of setting up filters for scanning your emails and notifying you. – A custom contact form that your contacts can fill to contact you without knowing your phone number. – iPhone/Android client push notifications. – A handy guide on how to avoid email overload without checking your email. – AwayFind offers different pricing plans. The individual plans range from $5-50/month, and there’s a version for businesses as well. The free plan includes limited access to features and smaller caps for alerts while the other paid plans include access to all features and up the caps for alerts. We think of AwayFind as a natural extension of SaneBox. 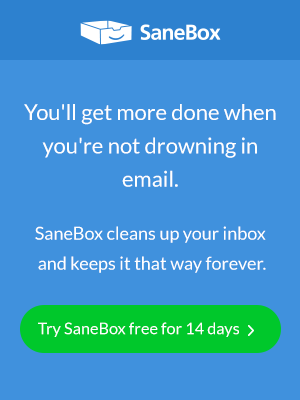 SaneBox helps you spend less time in your Inbox, and AwayFind lets you leave it altogether. Check it out, and tell them the SaneBox Gang sent-cha.